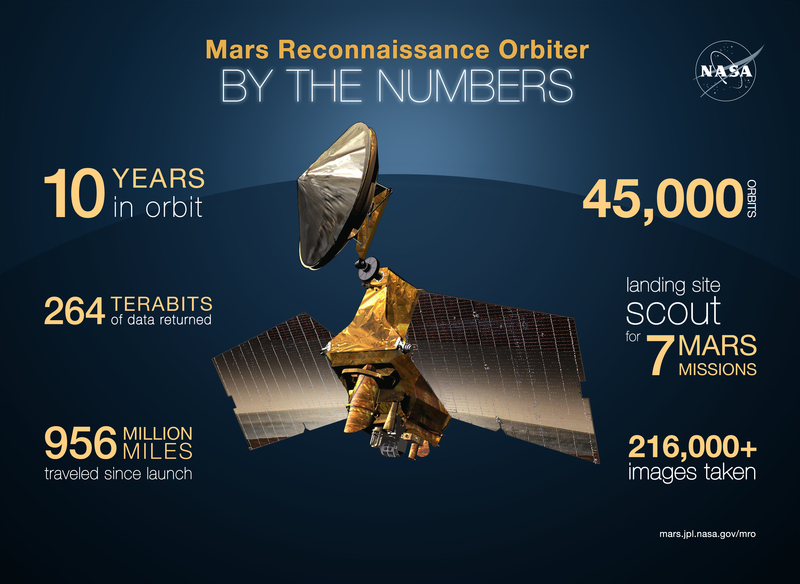 This week marked the 10th anniversary of science operations of the NASA Mars Reconnaissance Orbiter (MRO). Launched 12 August 2005, MRO commenced orbit around Mars on 10 March 2006. During its 10 years of orbital reconnaissance and exploration of Mars, MRO has travelled over 1.5 billion km, orbited Mars 45,000 times, returned 264 terabytes of data, taken over 216,000 images and been a scout for the landing site of 7 Mars missions, including Curiosity and the Phoenix Lander. The key science goal of MRO is to understand the history of water on Mars. Previous Mars missions have provided an abundance of evidence that water once flows on the surface of Mars, but exactly when and for how long surface water existed on Mars and whether it could provide a habit for life is what MRO was to investigate. To date, MRO has shown us that Mars hosted a wide variety of wet environments several billion years ago and that more recently water has cycled between the gas phase and polar ice deposition and lower-latitude ice and snow. The most spectacular finding to date, announced 28 September 2015, was the evidence that liquid water flows on the surface of Mars today. Since September 2006, MRO has been flying on nearly circular orbits above Mars at altitudes between 255 and 320 km. Each orbits take about 2 hours, allowing MRO to complete 12 orbits per day. (You can follow where MRO is right now on its current orbit via this link.) The patch of ground directly below MRO is known as the “ground track”. After 359 days of orbits, the ground tracks cover the surface of Mars with less than 5 km separation. There are 6 science instruments on MRO, which inlude 3 cameras, a spectrometer, a radiometer and a radar. Imaging by the Context Camera (CXT) has mapped out almost 95% of the martian surface to a resolution of 6 meters per pixel in its greyscale images that cover a swath 30 km wide. These wide-field images provide the context for the high-resolution HiRISE (High Resolution Imaging Science Experiment) camera, which takes all the gorgeous surface images, and CRISM (Compact Reconnaissance Imaging Spectrometer) which provides information on the composition of Mars. HIRISE operates at optical and near-infrared wavelengths and can distinguish objects 1 metre in size, providing unprecedented resolution in planetary exploration missions. It studies a wide range of surface features to help us understand the dynamic environment of Mars. CRISMs main science goal is to hunt for minerals that form in water, that might point to ancient hot springs, thermal vents, lakes or ponds that once existed on the surface of Mars. From an altitude of 300 km, CRISM can map features as small as 18 m wide. CRISM’s wavelength coverage in from the optical at 360 nm through to the mid-infrared (3.92 microns) The optical traces iron minerals while the infrared traces sulfate, carbonate, hydroxyl and water in mineral crystals. 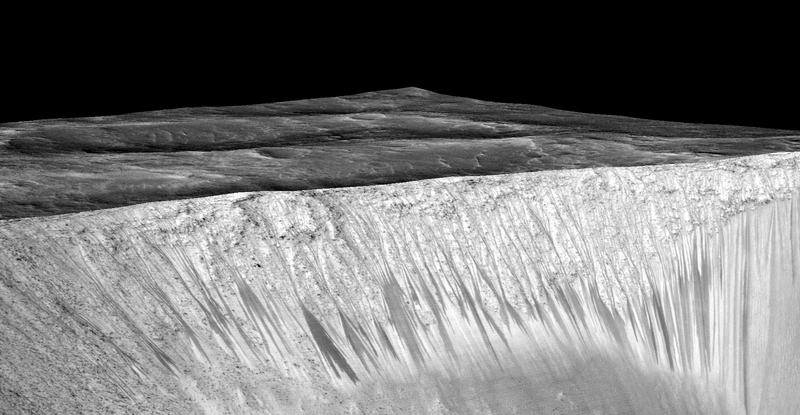 The CRISM instrument provided the long-awaited evidence that liquid water flows on the surface of Mars today. MRO has imaged dark streaks on the steep sides of some sun-facing craters that vary over time, showing darker features that appear to flow down the slopes during warm weather and fade as the temperatures cool. These features, called recurring slope lineae (RSL) have long been through to be related to liquid water. The CRISM findings confirmed that the RSL are related to hydrated salts, which lower the freezing point of salty brines. The spectral signature is that of hydrated minerals called perchlorates, which on Earth have been known to keeps liquids from freezing down temperatures of -70C. As well as exploring the surface composition of Mars, CRISM is also investigating the martian atmosphere, trying to understand how atmospheric dust affects the climate, how non-condensing gases like carbon monoxide and nitrogen in the atmosphere vary by seasons, and what process occur during the formation and sublimation of the seasonal polar ice caps. MRO also provides crucial support for rover and lander missions to Mars. As well as determining potential landing sites, MRO also helps rover teams choose both routes and destinations, as well as relay data from the surface missions back to the NASA Deep Space Network antennas on Earth. MRO is also helping choose potential landing sites for future human missions in NASA’s Journey to Mars. Next mission to Mars? The ESA + Roscosmos ExoMars programme, which aims to investigate whether life has ever existed on Mars. The ExoMars programme includes two missions, the first to be launched this week! Watch the ESA ExoMars launch on 14 March from 08:30 GMT, with the launch scheduled for 09:31 GMT.